The snow tussocks begin to wave in a different direction, indicating a shift in the cool wind. Your scent is now heading right for the quarry, and you know it’s only a matter of time before he’s onto you. Your pulse quickens, despite your best efforts to remain calm. You’ve been here before, not this location, but in this situation. It is familiar, yet somehow different – exotic even. You remind yourself that this very moment is why you’re here: 7,000 miles from home. out what it is awakening his nostrils. You allow yourself a moment to appreciate his magnificence before focusing in on your scope; you have mere seconds before he’s gone. You steady the crosshairs and squeeze the trigger like you have so many times before. ality and not a nightmare. Add this to the fact that hunting in New Zealand is largely unregulated and you’ll soon start to realize that a little research goes a long way. international hunters on our estate, High Peak, for almost 30 years. We have seen a large amount of clients over the years, sharing their experiences as they undertake a journey of anticipation, excitement and ultimately success. Unfortunately, we’ve also heard our share of horror stories. Over the next four issues of California Sportsman, I will be sharing our knowledge of the industry with you, along with a few insights that we’ve distilled into some vital actions to ensure you make the right decisions when booking your New Zealand hunt. In this issue, we’ll set the scene by exploring the history of hunting in New Zealand, along with a bit about location and species, in terms that are relevant to you, the international-traveling hunter. In the next issue, we’ll look at the right type of New Zealand hunt for you, followed by the seven costly mistakes to avoid making. In the fourth and final installment, we’ll give you 10 frequently asked questions you should bring up to your outfitter. Armed with this knowledge, I guarantee that you’ll be able to go forth and make your inquiries with confidence. Understanding where the New Zealand hunting industry came from provides a sound background to the advice that will follow. Wind the clock back 150 years and you’ll see a New Zealand with no species of big game – at least not as we know them. New Zealand was a country entirely dominated by birds. The early European settlers, who were missing their favorite pastimes from back home, set about introducing myriad game species – from rabbits through to moose. Some introductions were successful, some less so, but all species were introduced on the basis of being available for every New Zealander to hunt. 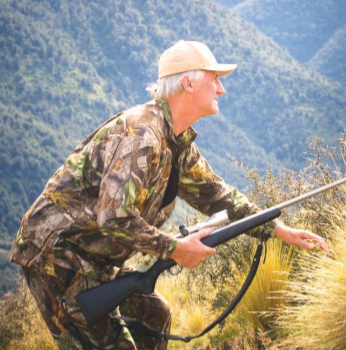 Gone was the elitism and privilege of European hunting, and to this day it remains the right of every Kiwi to grab his or her rifle and head into some of the 4 million acres of public land to hunt. Despite this egalitarian approach, some species did a little too well. In the case of red deer, the world-leading quality of the wild trophies in the 1930s and ’40s soon gave way to overpopulation and resulting habitat destruction. In response, the New Zealand government implemented deer-culling programs in the 1950s and ’60s, whereupon paid hunters armed with military surplus .303 rifles would head into the bush for weeks on end with the sole purpose of reducing deer numbers. A few enterprising hunters began to realize there was a demand for the venison harvested as a result, and an export trade was quickly developed. While deer were recovered from remote locations by horseback, jet boat and bush plane in the beginning, it was the introduction of helicopters that really made an impact on the numbers. Initially using the machines as a means of transporting the meat out of the wilderness, the helicopter crews rapidly evolved into highly efficient aerial gun platforms, so good at what they did that they soon realized they were going to shoot themselves out of a job! Again the pioneers adapted to the situation and turned their flying gunships into flying live-recovery platforms. The express purpose of this was to capture live deer and sling them back to newly established deer farms. how to breed bigger and better antlers to capitalize on this growth. Now, you can probably see where this is going. As a direct result of the breeding of better velvet stags, farmers also began to breed significantly wider, heavier and more multi-pointed trophy heads. 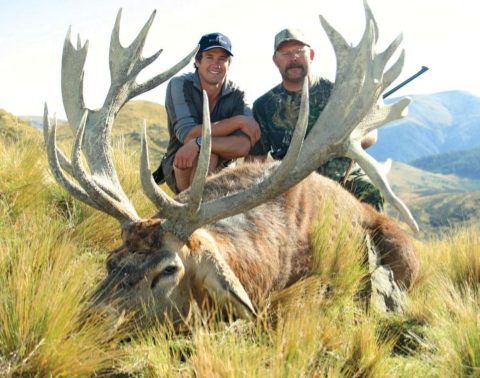 Before long, New Zealand was producing red deer trophies far in excess of any other country, and international hunters were starting to take note. 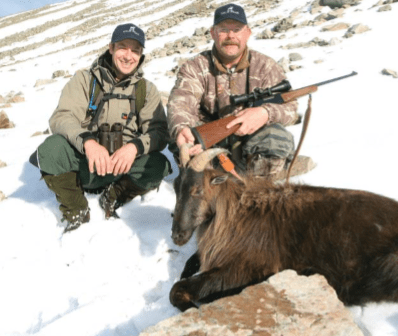 Thus, the modern New Zealand trophy hunting industry was born, with red stag as its cornerstone prize among big game, closely supported by Himalayan tahr, alpine chamois, elk, fallow deer, wild boar and a handful of other species. So what does this mean to you, the international traveling trophy hunter? Well, you now know that hunting in New Zealand is relatively free of restrictions in terms of seasons and access. You know how our big game species came to be here and how New Zealand came to lead the world in red deer and wapiti (elk) trophy genetics. And you know that the New Zealand hunting industry is an unregulated environment, one where keeping your wits about you in the initial planning stages can result in a life-changing experience for the better. Editor’s note: Simon Guild is a director of High Peak, one of the oldest hunting estates in New Zealand. He and his brother Hamish co-wrote The Hunters’ Guidebook to New Zealand with the aim of providing quality decision-making guidelines to visiting international hunters. Find out more at huntingredstag.com. In 2004 I made my First trip to New Zealand with my dad to hunt the iconic Himalayan tahr. This was early in my hunting career, and it was my first mountain or cold-weather hunt ever. I was completely unprepared. My hands were freezing in my cotton gloves, and my fuzzy fur hat is still a topic we laugh about to this day. But I ended up loving the experience. It was a turning point for me. I got serious and realized how much I loved to hunt, and hunt hard. That trip we hunted with Chris Bilkey of Track and Trail Safaris New Zealand (+64 3 693 7123; chrisbilkey.co.nz). I swear that that man is half mountain goat; the way he trots up those steep peaks is simply amazing. I struggled to follow him when it was my day to hunt tahr. We traversed the mountains, glassing as we went, and after a short while we found a great big wild goat and decided to take him. The area was so steep that when I lay down to shoot, I kept sliding downhill. My dad, Craig, got behind/under my feet and I basically stood on him so I could be prone against the mountain and shoot. After I shot, my tahr fell on a rocky outcrop above us and didn’t move. Chris trotted up the mountain, across some treacherous shale and pulled the tahr loose. The animal slid down the shale, right past us and down the mountain. We hiked down and found him at the bottom. The shale is so small that the slide didn’t cause any damage, and, man, was that a convenient way to get my tahr to the bottom! Dad got one on that trip as well. All in all, it was a wonderful experience – one that I hoped we could have again. Time passed, as it always does, and although we kept in contact with Chris and his wife Peg, my dad and I didn’t get a chance to hunt with them together for many years. I visited them and he visited them, but never the two of us at the same time – until this year! Finally, a decade (plus a year) later, Dad and I ended up back in camp with Chris and Peg. I’ve hunted in New Zealand a few times over the last few years, but I’ll save those stories for another time. This was our reunion trip, and it felt good! I am a collector now, and one thing I desperately wanted to add to my collection was a free-range fallow deer from New Zealand. I mentioned this to Chris at one of the sportsman conventions in January, and he told me he had the perfect spot to find me one. My dad, his wife Donna and our doctor friend Sadaf Khan joined me, and each of us had a personal mission to accomplish as well. Donna went first and shot a beautiful tahr with a big blonde mane. Sadaf was after a full bag, so her mission took a while longer. One day we decided that Sadaf and Donna would go up the backside of the mountain that I shot my tahr on so many years ago and hunt for one for Sadaf. Meanwhile, my dad and I would go with Chris and try to find a stag for Craig. We spotted a few stags scattered across the mountain first thing in the morning, but none of them were in shooting distance and the wind was howling. We decided to make a plan to close the distance on one particularly odd-looking stag. It had a few broken-off tines and some strange growth that Chris was concerned would be dangerous to the other stags, if they fought. Needless to say, Dad was more than happy to help take this stag out of the group. We worked our way along the mountain and tried to stay out of sight, but eventually the stag and a couple of does spotted us and fled. They ran into a thick patch of bush and stood in there feeding until they finally bedded down. They were obviously not too concerned because they could have easily gone up over the top and disappeared forever, but they decided to take a nap instead. We got into position and thought we would wait them out. An hour passed and Dad was becoming progressively less comfortable in his prone position over a pack. He was sliding and his neck hurt, but we were all afraid to look away in case the animals got up. So we made the decision to shift positions a little higher and a little closer. We were about 200 yards from them now but they were directly uphill in a very thick patch of brush. The only hope was that if they got up and moved right, they would cross an open shale slide about a yard wide. While this was not a huge gap, we hoped the shale would cause them to pause. Meanwhile, my dad was struggling to get into position and he kept sliding. Remembering our first trip 11 years before, I got behind/under his feet and he stood on my leg as I dug my boots into the hill as hard as I could. Just then the stags were up. Chris had moved out to the side to get a better look and had been spotted. They moved to the right, as we had hoped, but didn’t pause at all in the shale; rather, they just kept moving. There must have been a hole in the brush that we hadn’t seen before because just when I thought the stag was gone, he emerged with a full visible shoulder. Dad didn’t hesitate to take the shot, but while the stag reacted as though hit hard, it kept moving. Dad got another couple shots in as the stag disappeared into the brush. Chris was sure that it was down in that thick stuff, so we gathered up our gear and hiked over. The area was impossibly steep and thick, but Chris managed to find the stag, which had rolled a bit and become stuck in some brush. Editor’s note: Brittany Boddington is a Los Angeles-based hunter, journalist and adventurer. For more, check out brittanyboddington.com and facebook.com/brittanyboddington. With summer heat and the drought conditions gripping California, it doesn’t take much convincing for my family to head to the beach to fish. This time of year, we usually set aside one day during the weekend to drive to the shore to cast a line. Over the years, the girls and I have gotten pretty good at sampling the angling action down at the beach. We challenge each other, have good-natured contests and always keep count of how many fish we catch. We go to cool off, but the action there can be hot. Early this summer we headed north for an annual family camping trip near Avila Beach. I checked out the surf fishing report, and even though the action looked slow, we were all excited to fish a brand-new shore. Avila Beach is located in San Luis Bay, about 160 miles north of Los Angeles and not far from more celebrated Pismo Beach. The beaches here are well protected and there are two piers open to the public. The surf in the bay is usually small and beach access is easy. We loaded the truck with gear and headed north. A few hours later, when we first spotted the large bay from the frontage road, we noticed some commotion between the two piers. A large group of people were gathered at the center of the fishing pier and looking towards the boat moorings. Gulls and pelicans hovered over a dark spot about 100 yards from the pier. Almost in unison a dozen flying birds fell from the sky and splashed into the calm sea. Additional splashes erupted around them as baitfish attempted to escape the predators from above and below. While a bird diving into a large ball of bait is something to see, I found it hard to believe that the commotion was enough to draw such a crowd. But then the birds suddenly took flight – two whales erupted from the surface, mouths open, filling them with fresh fish. The signs of life in the bay had us all excited to toss a line. After we got settled, we headed down to the beach and walked the boardwalk, checking out the sights. The whales were still splashing around in their food and the crowd had moved further down the pier, watching and taking pictures. We had decided to wait for a better tide and fish the next morning before the crowds took over the beach. We were out early and the girls and I headed out to fish the shore. The tide was perfect and the waves were small. The first beach was very shallow and we didn’t get any bites, so we shifted further south. After a few casts, Alyssa, like she always does, hooked up first. She dragged a chunky barred surf perch through the surf. I could tell by her beaming smile that she wanted a photo, so I grabbed the camera. Less than five minutes later her sister, Jessica, hooked a perch. I added a very large jack smelt to the count before the fishing shut down. We spent another hour on the shore casting before we decided to call it quits. The sand crabs were there, but not in the numbers I had seen to the south. The reports had stated that the bite in and around Avila Beach was slow and the lack of bait was the reason. I really didn’t care. I had a great time walking the beach with my daughters, watching them catch fish and cast. Long gone are the days where I do much for them on the shores anymore. They know how to rig, cast, catch and unhook. They aren’t tagalongs now; they’re my fishing buddies. We ate dinner on the coast, and the girls decided that since the fishing was slow at the shore, we should try fishing from the pier the next day. After a quick breakfast, we beat the crowds and headed for the Port San Luis Pier, north of the fishing wharf at the center of the beach. I had fished this pier a few times as a boy and caught lots of juvenile rockfish. We headed to the very end – that’s just what you do when you fish a pier – and tossed the rigs out. We started getting bites almost instantly, but hook-ups weren’t happening. I decided to rig up some smaller lines to see what was happening out in the bay. Jessica was the first to pull one of the bait stealers from the bottom. She caught an 8-inch lingcod. The little fish was a perfect miniature of the toothy adult that lurks in the deep and eats 3-pound rockfish whole. With the new rigs, we caught a dozen of them in half an hour. The current California Department of Fish and Wildlife regulations state that lingcod need to be 22 inches long to keep. The juvenile fish were way too small, and besides, we weren’t keeping anything on this trip. the girls cast and attend to their gear. I thought about the early days of fishing, when I had to take care of everything. Now, when we headed out to fish, they grabbed the gear and they cast the lines. They have become proficient anglers. A few minutes later, Jessica hooked a different fish. She brought it over and showed me a juvenile cabezon, about 4 inches in length. Again the little sculpin was a perfect miniature of the adults I used to see diving. We carefully unhooked the fish and released it. As we fished the rustic pier, the whales made a showing near the moorings adjacent to the wharf. We could see baitfish flail in midair as the huge mammals rushed the surface with their mouths gaping wide. Seagulls and pelicans dropped from the sky and feasted on the stunned and injured anchovies that floated near the surface. I was lost in the natural moment when I heard Jessica comment on how much life there was in the little bay. She was watching the whales consume hundreds of pounds of fish in single gulps, and diving birds taking their share as well. Life and death, I thought. Since the fishing had slowed, I decided to educate the girls on why we were catching so many juvenile fish in the bay. I told them the story of when I was 10 and how my parents let me and my brother fish this pier one afternoon. Using tiny hooks and pieces of squid, we had caught dozens of juvenile bocaccio, a rust-red rockfish. In the times before size limits on this species, we took our catch back to our parent’s motor home and my mom cooked them all up for dinner. I let the girls know that during my college days I worked on several marine contracts where we needed to drag sampling gear through this very bay for fish research. The hauls contained juvenile halibut and other species of juvenile rockfish. Now, bringing it back to our catch, the girls started to understand what types of fish were present in the bay. I told them that most bays and estuaries in California serve as nurseries for many species of fish, and thus are very important as far as the overall health of many of California’s nearshore fisheries. The examples of feeding whales, diving birds and noisy sea lions also illustrated the bays’ importance. The whales had moved on and it was getting late. We packed everything up and started walking back to the parking area. At the foot of the pier was a small shop selling all sorts of seafood. The vendor had several large tanks filled with various sea creatures that were all for sale. In an acrylic tank near the walkway sat a grumpy-looking lingcod that weighed close to 20 pounds. I called the girls over and showed them the fish. I told them that this was an adult version of the ones we were catching at the end of the pier. They were both impressed with how huge those little fish could get. One of the things I want both my daughters to realize is that just because you come back with an empty cooler doesn’t mean the day wasn’t successful. I want them to know that the reason I teach them to hunt and fish is for the experience rather than bringing home fish or game. Jay Spinner had an idea back in the early 2000s. He had created a tourism website for Ensenada, Mexico, ensenada.com. But in talking to some of the locals he decided to try something completely out of his comfort zone: charter boat ?shing in the warm and ?sh-?lled azure waters of the Paci?c Ocean. The ?rst thing he needed was a boat. “I found an old 1970 Luhrs 32-footer that had 300 hours on the rebuilt engines. The boat was in the Long Beach Harbor and reasonably priced,” says Spinner’s Selena Sport?shing Charter website (selenasport?shing.com). His new investment successfully made the trip from Southern California to Baja, and after lots of hard work and TLC his six-pac boat became a reality (read his website for more). We chatted with Spinner about his now successful business. California Sportsman How long have you been in business? Jay Spinner About 14 years. Two years after creating ensenada.com, I thought I would do something different and talk to some of the charter owners about me doing online reservations for sport?shing. To make a long story short, it was an instant success. In fact, I had to jump fast to get credit card services and a system set up. Two seasons later I was doing over 600 charter reservations and learning a lot about ?shing and the charter business. In talking to hundreds of clients, I began to see a pattern in what they liked and didn’t regarding the boats and their experiences ?shing in Ensenada. I started to think, “If I had a boat, this is what I would do,” based onnothing more than comments from my clients. I was booking seven to 15 charters a day in the summer and saw an opportunity that would never happen in the US to a guy who didn’t know crap about boats or the ?shing business. CS What should we know about ?shing in Baja? JS Ensenada offers a different dimension to long-range sport ?shing because the charter boats leave between 1 and 2 in the morning and return at 6 in the evening. Shorter travel time allows ?shermen more time to take in some of the other great experiences that Ensenada has to offer, including dining, shopping and nightlife entertainment. CS What’s the best day or period you have had on a charter? JS I would say 2014 was the biggest year I have seen for blue?n tuna. We put 50- to 100-pound blue?n on the deck, unlike the 25-pound average in past years. The best year I saw for dorado was probably 2006, and 2004 was a great albacore year. The albacore season was like clockwork until 2010. We have not seen them since. In prime time, 20 to 30 ?sh on a six-pac charter of a combined catch of yellowtail, tuna, dorado are not uncommon. So the best catch depends on what suits the angler most. CS What makes you stand out from the other businesses? JS Over the past 14 years I’ve worked off and on with several of the charters in Ensenada and presently represent about 20 different charters. I have also owned my own charter, Selena, for the past 10 years. I have developed a rapport with many customers over the years, and what I strive to do is explain to people exactly what to expect and not overexaggerate. Editor’s note: For more on Selena Sport?shing Charters, call (949) 678-1187. When it comes to world-class fisheries, you’d be hard pressed to find one that isn’t chopped up into special-interest sections. Oswego County’s Salmon River is a pioneer in this process, offering a place for every fishing taste. Its most famous section is at its headwaters a short distance from the Lower Reservoir’s dam. Restricted to fly-fishing, catch-and-release only, this mystique is more than purist anglers can resist. But there’s more to the place than just image. The main river runs just above and below the mouth of Beaverdam Brook, the recipient of the Salmon River hatchery’s tailrace and off-limits to angling. Hence, the special area’s two sections allow angling as close to the hatchery as is legally permitted. Split into upper and lower stretches, these special areas run less than a mile combined. But their close proximity to the dam draws and holds the river’s greatest number of Lake Ontario’s migrating salmonids: brown trout, king and coho salmon in the fall, and steelhead year-round. Indeed, autumn sees so many salmon milling around above the Altmar bridge, anglers joke they raise the water level a couple feet or more. Some make it into the relative safety of Beaverdam Brook, climb the ladder and enter the hatchery. Those that remain in the river are fair game for fly-fishermen, considered the gentlest, most patient segment of the fishing fraternity. Self-professed purists, fly-fishers use lures made of feathers, tinsel, maybe a little yarn for body, all held together on a single hook by thread. Unlike lures in your average tackle box, these delicate creations are practically weightless, requiring long rods and heavy lines to propel them to the target. Anglers need lots of room to whip the line through the air, slowly playing it out, generating enough force to go the distance. The technique requires good timing and coordination; and when done properly, looks like a dance where man, physical forces and the fly are in perfect motion. The tackle is of the most elementary design, modern improvements notwithstanding. What’s more, the heavy main line doesn’t help with fighting the fish. You see, it’s too thick to thread through the fly’s eye, and makes too much noise when it hits the water. So a monofilament leader at least 8 feet long, averaging 10-pound-test, is used as a remedy. What you gain in stealth, you lose in strength, however. When hooked, a large salmon or trout does everything in the book to break free, including hiding behind boulders, diving into root balls, undercut banks and sunken timber, even going over waterfalls. It’s enough to make the leader feel about as useful as sewing thread. Fly-fishing’s poetic moves and unique challenges have hooked the imaginations of the uninitiated, convincing them it’s highly specialized and difficult to master. Anglers ranging from bank fishermen to deep water trollers admire its choreography. So when fly-fishers asked for a special section–complete with environmentally-friendly stairs down a steep cliff and improved banks for solid footing–everyone went along. Altmar marks the start of the special zone. The lower area runs from the County Route 52 bridge upstream for 0.25 mile to the marker just below the mouth of Beaverdam Brook. The upper section runs from a marked boundary above the hatchery upstream for 0.6 mile to the marked boundary at the lower reservoir’s tailrace. The special sections have their own seasons, too, apparently to allow salmonids, primarily steelhead and brown trout to spawn naturally without harassment. The lower section is open from September 15 through May 15; and the upper section is open from April 1 to November 30. For Oswego County fishing conditions and visitor information, go to www.visitoswegocounty.com, or call 1-800-248-4FUN. Located on Ketchikan’s historic waterfront, The Cedars Lodge offers the best that Southeast Alaska has to offer: luxury accommodations, seasoned guides, top-of-the-line processing equipment to ensure the highest quality for your catch, and exceptional customer service. The Cedars Lodge seeks out Ketchikan’s finest independent guides and puts them to work for you! Saltwater trips routinely target multiple salmon species, halibut and bottom fish each day. Our freshwater fishing excursions will take you to remote local lakes and rivers, some of which are only fished a few times each year, providing a once-in-a-lifetime experience. Combination guided saltwater fishing and guided freshwater flyouts are also available for the ultimate Alaskan fishing vacation. Fly fishing season is upon us. Presently we are very busy loading up supplies and making sure Katmai Lodge is ready to open in June. We are very excited to begin this season with you. Katmai Lodge would like to offer you a ONE-TIME SPECIAL PRICE of $5,000 for a SEVEN-NIGHT STAY on two of the most overlooked weeks of the year. This week was last year’s BEST for king and sockeye fishing as well as great trout and grayling. With the mild winter and early spring, the Alagnak River should be in prime shape for another early arrival of kings en masse. Coupled with the Alaska Department of Fish and Game wanting to get sockeye escapement into the river, this is the most consistent week for non-stop numbers. It’s also a perfect time for trout and grayling on mice and other dry flies. Always wanted to learn to fly fish? Catch that king salmon on the fly? This week of transition is the time 90 percent of our king run is already here and the chum salmon run is at its peak. With the onset of the pink salmon run and shots at silvers, the river will be boiling with fish (only sockeye are unavailable at this time) – and it is all here waiting for you, all at a time without pressure on the river though not for a lack of great fishing! 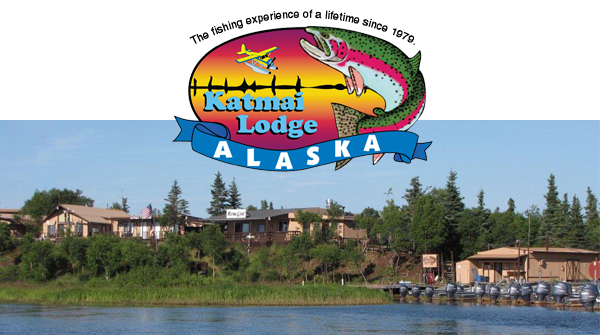 Katmai Lodge offers personalized fishing adventures for groups of all sizes and experience levels. Accessed through its private airstrip with its own amphibious equipped de Havilland Turbine Otter, the main lodge rests atop a bluff overlooking the Alagnak River, offering hundreds of miles of fishing in Alaska’s only designated Trophy Fishing Area. Already one of the great fishing ecosystems in Alaska, fishing on the Alagnak continues to improve. The pristine river is uniquely home to all five Pacific salmon species along with native stream fish such as rainbow trout, Arctic grayling and Dolly Varden/char, with four or five salmon species spawning within 2 miles below and 45 miles above the lodge. The region is also home to a diverse array of wildlife, which provides amazing photo opportunities. An experienced guide staff personalizes each guest experience, making use of the lodge’s 40 boats to explore the full range of the Alagnak. Our river-based lodge is only 10 minutes away from tidewater. Its diverse fleet of both jet and prop boats allows for both sea-fresh salmon and rainbow trout fishing, while the lodge’s floatplane enables easy access to Katmai National Park for viewing the renowned Brooks Falls brown bears and for fishing the area’s many blue-ribbon trout streams. When off the water, anglers are encouraged to enjoy the unrivaled amenities of Katmai Lodge, which boasts more square footage per guest than any other lodge in Alaska. World-class chefs prepare hearty breakfasts and gourmet dinners in the central dining room. The main lodge includes a fully stocked fly-tying area complete with expert instruction, central gathering place, a clothing and gift shop as well as Internet access. Adjacent guest cabins welcome anglers to rest and relax, offering the privacy of individual common areas. The high season for Alaskan salmon fishing at Katmai Lodge runs from late June through September, with trout season opening June 8th. For reservations or to inquire about group packages, anglers should visit the newly launched website at www.katmai.com or call 1 (800) 330-0326 for more information. Port Lions Lodge is located in the community of Port Lions on the north coast of Kodiak Island, Alaska. Port Lions Lodge is a premier, full-service hunting and fishing lodge that offers comfortable accommodations, first-class family style dining, and breathtaking views of the stunning natural beauty of Kizhuyak Bay and the Kodiak Mountains. Enjoy fishing, hunting, whale watching, bear sightings, berry picking, hiking, sea kayaking, and more from our scenic waterfront property. With professional guides, cooks, and hosts, a vacation at Port Lions Lodge is not your typical hunting or fishing vacation. Warm showers, hot meals, and comfy beds await you at the end of every day. Nature is all around us at Port Lions Lodge. Enjoy daily sightings of local marine and land-based wildlife, including the famous Kodiak brown bear, humpback whale, orca, sea lions, puffins, arctic fox, Sitka deer, bald eagles, and more. Our owner-operated lodge is the perfect place to experience all of the natural beauty Alaska has to offer. For more information, visit www.portlionslodge.com. Have you ever thought about how your dream hunt would play out? Would you be on an African Safari tracking a Lion, in Argentina hunting Doves, or how about going after a Javan Rusa Deer in Australia? For Drew Zimmerman his dream hunt involved a Stone Sheep Hunt and he knew without a doubt that at some point in his life he would make this a reality. This really was the hunt of a lifetime for Drew and he describes this as a hunt where you “physically paid your dues and earned” the results of the 10 day hunt. Drew’s whole hunt revolved around one thing – finding the Mountain Monarch. For days, he searched with his guide in the rugged mountain terrain for that perfect ram. They spotted many nice rams, but there was always something that prevented the shot. Then, after battling the weather, day 9 began to fall into place and after careful stalking Drew was set up with a 250-yard shot, but at a very steep angle. Although this shot didn’t quite connect, after a 300-yard dash to cut the ram off, Drew had another opportunity to shoot and he landed a perfect center mass hit. Finally, Drew had his Mountain Monarch! Drew had always wanted to make his dream hunt a reality and he is grateful that “being a member of the Hunters and Guides Connection provided this opportunity at a considerable savings and sooner than anticipated!” Drew also shared that by being a member of the Hunters and Guides Connection for only $199 a year he saved $9,000 on this hunt cancellation. Although Drew’s “dream hunt” has now become a cherished memory, he looks forward to continuing o use the Hunters and Guides Connection to help him plan and save money on his next hunting adventure.